The game isn't called "HD Remaster" for nothing, you know! The upcoming hi-def version of the 2002 GameCube remake features some really polished graphics. Below, in images from Capcom Unity, you can compare to see how they stack up! 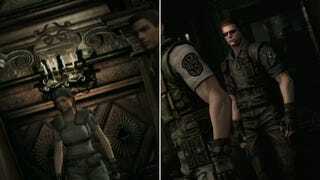 According to Capcom Unity, the original images were grabbed via component cables and then cropped to match the widescreen mode. The HD Remaster will also have the original 4:3 mode as an option. Capcom should've included the 1996 Resident Evil for an even more dramatic comparison. Resident Evil HD Remaster will be out in the West on Xbox 360, Xbox One, PS3, PS4, and PC early next year.